BTS is set to perform on Saturday Night Live for the first time, continuing to establish their status as a global music supergroup. The seven-member K-pop group — comprised of Jin, Suga, J-Hope, RM, Jimin, V and Jungkook — has captured the hearts of millions of fans around the world since their introduction in 2013. While K-pop has always been a wildly popular genre, BTS and other modern era acts have crossed the boundaries of the genre's impact on an international level. RM (born Kim Nam Joon and also known as Rap Monster) was the first member to join BTS in 2010. He is considered the group's leader and spokesman, E! News writes. "I was an underground rapper and only 16 years old, a freshman at high school," RM told Time in 2017. "[South Korean producer Bang Is-hyuk of Big Hit Entertainment] thought I had potential as a rapper and lyricist, and we went from there." Soon after the group's other members assembled, bringing with them their own sets of talents as vocalists and dancers. Bang previously told press his idea for the group's image was to create a hero that stands alongside fans, rather than a role model to see from afar. This led to the decision to allow the pop stars to talk openly about their struggles with fame from the very beginning. RM opened up about the subject to Time saying, "We're just a normal group of boys from humble backgrounds who had a lot of passion and a dream to be famous...We came together with a common dream to write, dance and produce music that reflects our musical backgrounds as well as our life values of acceptance, vulnerability and being successful." The connection the band shares with fans has led them to achieve levels of global superstardom not seen in many years, and barely ever for a non-English-speaking band. By 2015, they made their first appearance on the Billboard 200 chart, just a year later, their album Wings peaked at No. 26, the highest-ranking for a K-pop album ever. Since then the group has broken ground in America. 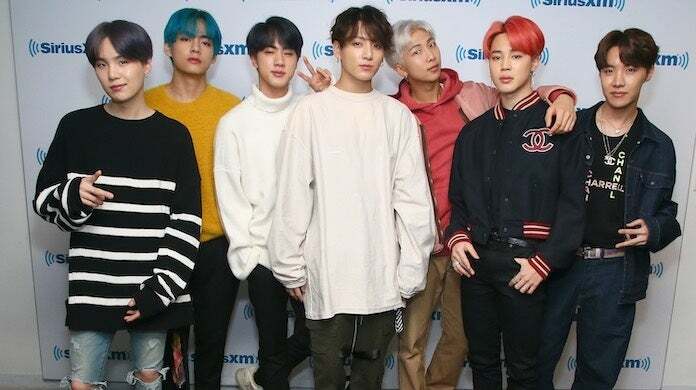 The group holds the record for most viewed K-pop group music video on YouTube — and broke the record for most views in the first 24 hours Saturday for their new single "Boy With Luv" featuring Halsey. BTS was also the first group of its kind to perform at the American Music Awards, win a Billboard Music Award (beating Justin Bieber and Selena Gomez in 2017) and earning two No. 1 Billboard 200 albums in the same year (2019). The group also made their first appearance at the 2019 Grammys. And sold out New York City's Citi Field in minutes for the first performance by a Korean act at a U.S. stadium. When a music act has a strong fanbase such as BTS' ARMY, the level of success comes with some sacrifices. Jimin previously admitted to press the members rarely get to go "get some fresh air" without causing an uproar. The group has also lived together since the beginning of the group — a common tracts for K-pop stars. "We've been living together for a while now, almost eight, nine years," Jimin told EW. "So in the beginning we had a lot of arguments and conflicts. But we've reached the point where we can communicate wordlessly, basically just by watching each other and reading the expressions." While many compare the level of hype surrounding BTS today to that of The Beatles at their peak, RM opened up about not always feeling comfortable with the comparison. "Sometimes it feels really embarrassing when someone calls us a 21st-century Beatles or something like that," RM said. "But if they want to call us a boy band, then we're a boy band. If they want to call us a boy group, we're a group. If they want to call us K-pop, then we're cool with K-pop." As the group enjoys their record-breaking careers, they have their eyes set on breaking ground by earning a No. 1 song on the Hot 100 singles chart. The group also hopes their success will translate into a Grammy nomination soon. The key, they say, is to stay true to who they are. "A Hot 100 and a Grammy nomination, these are our goals," RM told the outlet. "But they're just goals — we don't want to change our identity or our genuineness to get the number one. Like if we suddenly sing in full English, and change all these other things, then that's not BTS. We'll do everything, we'll try. But if we couldn't get number one or number five, that's OK."
With the release of their latest album, Map of the Soul: Persona, ahead of their landmark performance on Saturday Night Live — a first for a K-pop group — the group still has plenty to look forward to in the future. The group landed in the Guinness Book of World Records for the size of their ARMY and will have an official line of dolls based on them through Mattel coming out in the summer. It is safe to say that BTS's star will shine for many more years, and firsts, to come.